Review posted September 26, 2018. Scholastic Press, 2016. 313 pages. I've loved horse racing novels since I was a kid collecting The Black Stallion books. 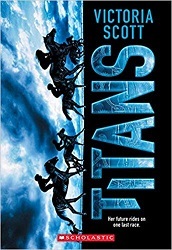 This book is in that tradition -- except the horses are "Titans" -- sophisticated robots with artificial intelligence. Astrid has loved watching the Titans race since she was thirteen -- which was also when she first saw a man die in a race. They run and the world trembles beneath my feet. Steam puffs from their nostrils and their eyes cut a crimson path and their bodies clash against one another, steel on steel. As the Titans rumble past, a smile sweeps across my face. Watching them is like kissing a speeding train. Like dancing with a hurricane. The horses are terrifying and beautiful at once. They are mindless beasts, but under the stadium lights, their bodies moving down the track like ghosts, they are glorious. Racing the Titans is a rich person's sport, with huge entry fees and a high price for the Titans, but betting on the Titans entertains the masses. It also ruined Astrid's family's financial situation. Of course her father didn't know he was about to get laid off when he gambled so much money on a Titan. But Astrid meets a grumpy old man who reminds her of her grandfather. And it turns out he has a Titan 1.0 he'd like to race. And she can do the riding. This book has all the tension of a classic racing novel. Teen gets a chance to race in the big leagues. The stakes are high -- both her family and her best friend's family are about to lose their homes. I stayed up to finish the book because I enjoyed the characters and the tension kept me turning pages. But I do have some quibbles with the story. I'm afraid I didn't believe in the "EvoBox" that was only in the Titan 1.0 model and gave the creature emotions. Artificial intelligence, sure, I can believe in, but it was a machine. Astrid felt that way at first and was won over -- but I'm afraid I really wasn't. And when her Titan's life was in danger, I'm afraid I was unmoved. Just build the machine again, okay? Another thing played on my little pet peeve. Astrid is a prodigiously gifted mathematician, so that means she's able to calculate angles in her head and see patterns and use that to take turns more efficiently. I've seen this idea in another book. The character was an exceptionally good pool player because they were good at math. I'm sorry, but having the physical skill to put your body or other things at the right angle is a very different thing from being good at math. As a kid, I was exceptionally good at math. I was, however, terrible at sports. This is not at all uncommon in people who are good at math. Even though, yes, there are math concepts behind pool shots, it doesn't necessarily translate into being good at pool. And it was hard for me to believe that being good at math would make Astrid good at racing robot horses. Does being good at math make people good at video games using joysticks? However, it was a good story, and I especially liked Astrid's friendship with Magnolia, who is especially talented at making hair accessories. Besides running in races, Astrid has to go to social events, like the ball where she needs to find a sponsor. Magnolia by her side keeps good humor in the story and adds warm light-hearted moments to what otherwise could have been a grim book.